That's Camille Goutal of Annick Goutal, explaining the inspiration for the line's latest perfume launch, Un Matin d’Orage. It's a reasonably accurate portrait of what you can expect, I suppose, although to my nose, Un Matin d'Orage is both drier and more transparent than what you'd get from "hundreds of bushes of gardenias" on a hot, humid day — and just as well, as such a thing might knock you out cold. The opening is heavily ozonic and aquatic, and has a slight mineral aspect; overall, it nicely conveys the sense of "after the storm". The gardenia and magolia stand out most clearly in the dry down (other notes: lemon, perilla leaves, ginger, jasmine sambac, champaca and sandalwood), but I cannot emphasize enough how soft and sheer and dewy they are: there's nothing cloying or heady about Un Matin d'Orage. The sense of fresh air and rainwater persists throughout; so that while the flowers smell lush and exotic, it is as though you are smelling them from a distance, and filtered through greenery and a slight fruity undertone (a friend described it to me as peach skin, and that's about right). It's beautifully done. It's pretty and spring-like and easy to wear (far easier to wear than Annick Goutal's last foray into the exotic floral category, the gorgeous but perhaps-not-for-the-office Songes), and I would think it will a big hit for Annick Goutal. All the same, I cannot decide if I love it, although I'm quite certain that if that butterfly bottle fell into my lap, I'd wear it. But just as some people have a mental block of sorts against lemon perfumes, and any lemon perfume, no matter how wonderful, is bound to remind them of furniture polish, so it goes for me with fresh notes. Anything overly ozonic, no matter how brilliant the composition, reminds me ever so vaguely of dryer sheets. I've been wearing Un Matin d'Orage for days now, and some days it seems too clean and fresh for my liking. I'm going to set it aside for a few months, and then see how I like it in hot weather. Annick Goutal Un Matin d'Orage was developed by perfumer Isabelle Doyen. 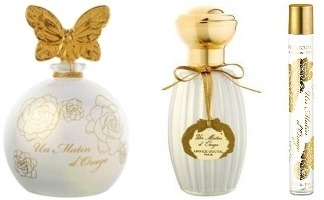 It is available in 50 and 100 ml Eau de Toilette (above center, $80-115), in the 100 ml limited edition white butterfly bottle (above left, $220), or in a 10 ml Rollerball (above right, $29). For buying information, see the listing for Annick Goutal under Perfume Houses. *Quoted in The Morning After at LifestyleAsia. Yep, set it aside until it gets warmer, R, and I think you will like wearing it a lot more. I think it's beautiful, a bit edgy, and different from anything else in the AG line. By the way, this is a great review, as always, my friend. Do you get any earthy dirtiness to it? I've heard of others getting this, I think in the drydown, and that's what's impelling me to buy a sample. I'm thinking of something like Demeter Rain and Demeter Dirt with some sheer florals – is that about right? I just hope this lasts a lot longer than a Demeter! A touch in the base, but to me, not even nearly so much that I'd describe it as D. Dirt with florals. Actually, that might be what I need to do: layer it with something earthier. I'm finding the lasting power pretty good. Sounds very nice. I'm curious about that aquatic/ozonic note — as I patiently away my Vanille Galante, do you see any similarity at all in terms of wateriness, or in the way it makes the whole composition “feel” sheer? I realize that's a hard comparison because the other notes are probably so different. Quite a few aquatic floral launches lately, no? I realized when reading this that I remember being in a hothouse filled with gardenias with my grandfather, buying a small gardenia bush for my mother for Mother's Day. I don't have an overwhelming scent memory of the moment, but it's a nice memory nonetheless. I'd be curious to smell this. Gardenia is one of those elusive scents for me; I prefer to smell them on the bush. I also can't help but have a weird moment every time I see the name of this perfume: my brain wants to make Orage into ORANGE. If I think of it as “Stormy Morning,” I'm less confused. Still, I like the word 'orage'. I do not get any melon here at all, but there is some stylistic relationship in the kind of airy feeling they both share — and yes, this seems to be the new thing! And I think it's almost impossible for an English speaker not to see the word Orange. I do something sort of similar with Pivoine: I think it's going to be pepper, not peony. Thank you for reviewing this … AG is one of my favorite houses, and this definitely sounds well worth trying, although it doesn't exactly sound like my “thing.” (I have issues with “overly fresh”) as well.) Also, it's still freezing out where I am, and maybe as spring sets in I'll be craving something like this. I wear Songes to work, no problem! That 10-ml rollerball is calling my name, and I haven't even sniffed this. (hands over ears) I can't hear you! I can't hear you! Na na na na na… when the bank account recovers, maybe then I will hear you. I put this on over 12 hours ago, and was just out watering my ferns when it came back in full, I live near the ocean and the freesias are blooming, but the scent of this was unmistakable. I don't get Gardenia, its green (the Perilla, I guess) and aquatic (a touch stagnant, really interesting) and a touch of white flower. At first application I smell melon rind. I think I love this. Thanks for your Blog, I really enjoy it. Got a sample of this the other day. Haven't tested it yet. I am slowly beginning to appreciate *some* AG scents. Their lasting power isn't great, unfortunately. I was kind of meh about Mandragore at first too, but also ended up buying a bottle! I guess you never really do know what will grow on you. This sounds so fantastic in every way. I love gardenia, most times, although am not wild about Gardenia Passion. I so look forward to trying this. Ooh, yeah… Orientatlistes in the less-spendy rollerball. Not a fan of rollerballs, but I am a fan of CHEAP. my guess is the same aroma chemical that provides the aquatic note in Matin, does so in Vanilla Galante. they both have the oddly off smell to me. Mandragore is the only Goutal I've tried that I even sort of like, so I guess I don't count as a Goutal fan. But this one sounds wonderful to me. I'm learning that I seem to prefer florals with a watery element. This one sounds almost like a sister to Fleur de Liane and Magnolia Romana. All three have that magnolia note, and aquatic notes. Do you see any similarities? Thanks for the review. I hear a rollerball calling my name! This sounds so pretty as well as looks so pretty! I'm craving a change of seasons too, especially since we had a teaser of mild weather a few days ago. This sounds perfect and I must try it. Saks has the rollerball online – $29! Yay! Surprisingly little in common with either other than those particular notes I would say, although I suppose now I ought to put on all 3 and see. The one thing I'll say about that rollerball is that this scent is so light that I would try it that way first…I'm thinking it might be something that I would need to spray, you know? But the rollerball is darned cute, and you can't beat the price. Joanna, I figured probably many people do — just meant that some people found it too heavy. I think it's lovely but it's not what I would call “easy to wear”, if that makes any sense. The rollerball is adorable. I just hate rollerballs. Wish they'd do a 10 ml spray! I'm not even close to wild about GP — they aren't much alike at all, don't worry. Bearing in mind that I applied this heavily (about 3-4 sprays, which for me is a lot), I found the lasting power quite good. Much better than Le Chevrefeuille, which I adore but which only smells great for about 90 minutes. I just hope I don't get any melon from this – melon doesn't work for me. Jealous!!! I am quite ready for 80 degrees. Hope this one will work for you! The bottle looks so nice in white, doesn't it? Even the “plain” bottle. With you on the rollerball issue AND the cheap issue! H: You're my frag twin. You must therefore LOVE Mandragore. It's not my holy grail, but as soon as I sampled it I had to have a bottle and managed to snare a big one soon after. It does sound like you'll like this; I think it might be a bit sweet for me, though I'm eager to sniff it. I still really need to try Liane. don't we wish all the perfume houses would do a little roller ball like that! It's funny, because I have been bemoaning the fact that all my scents seem so un-spring-like somehow and I just want something light and flowery and unusual. Ta-dah! Ozone and aquatic scare me a little but if they are done well it might be okay. I do have a hard time with the AG line – Songes was close, Mandragore was close, and both deserve a second try. I have been looking forward to this one. My brain always turns Pivoine into Poivre also. Those gosh darn roller balls, eh?!?! Well then, Joe, I am duty-bound to try Mandragore again soon. I DID like it, and still have part of a sample. And that rectangular purple bottle is the stuff of dreams. Hope you'll love it! And glad to see that more brands are doing small sizes…I guess that's the one good part about being in a recession. Seems like pretty florals are “in” at the moment, so I'm sure you'll find something! I was being so good. And now I am irresistably drawn to yet another AG. The gorgoeous bottles alone call to me but I love the scents too. Songes was an “acquired taste” indeed but well worth the acquisition! And I agree that it's too much to wear to work at least for me it is. I also adore Eau d' Hadrien and Eau de Camille and I just got a sample of Le Chervefeuille…okay I have become an AG addict … but I want that rollerball! Lovely review Robin! I am so glad you do not dislike it. I love the bottles. The 'plain' white bottle would look lovely displayed with the women's bottles of the Orientalistes. Oh how I wish bottles could be displayed without risking ruining the juice inside. I can't wait to try this scent myself. They really would look nice all in a group, along w/ Vanille Exquise too. LOL — really, I did not mean it could NOT be worn to work under any circumstances, just that it isn't a light, casual, “easy to wear” sort of scent. I almost don't even want to try it now because if I like it even a little I'll be tempted to get one. **Shaking fist at Camille G** for the super cute roller-ball. Hopefully my tendency towards not enjoying the aquatic floral thing will save my arse. Could. not. avoid. Saks. Ran in and sprayed some on my wrist before heading to hairstylist. Ran back down 5th Avenue at top speed one hour later to buy some. Have died and gone to heaven. Can’t smell any melon, thank heaven. BTW, Ron at the AG counter says that they’re already half sold out of this scent – rollerballs are gone – so make haste if you want to try it. How nice that you love it so much! Did you get the last rollerball or a bigger bottle? Finances being what they were and stock being limited, I bought the body cream. Unlike most AG creams, which come in a tube, this stuff comes in a pretty, very large jar and has a whipped texture. My experience with creams of this nature is that a little goes a LONG way. AG is also one of the few lines to make body creams that give you the same experience of having a fragrance “break down” as you would if you bought the EDP or EDT. Many lines just give you the top note in the cream. Ah, I’ll have to see if I can find a tester of the cream eventually! I had a bit of Petite Cherie body cream, but it was in the tube, and its shelf life turned out to be as short as the EdT’s. No matter how beautiful the top and heart notes are, if it dries down to an unscented tea candle accord with a whisper of lilies, it doesn’t matter. Man, those top notes were gorgeous though. It smells like what i thought VG would smell of. I tried this on at Nordstroms, and wandered around a bit, trying to see if I would like it or not. I like Gardenia Passion, so I thought that I might like this one, too. I am still not quite sure if I like it or not. It does have a Gardenia flavor to it, but I think it smells mostly like a juicy peach on me. I got stopped by multiple women as I wandered through Nordstroms, asking me what I was wearing. One woman found me again, and had purchased a bottle. It smelled wonderful on her. Smart of you to wait it out and not buy it right away though! I force myself to wait. I fall in love too easily! So much for self restraint! I just bought a 50mL bottle. I am going to try to get a roller ball, too. I think this will be my summer favorite, this year. It smells like a dewy-juicy peachy-version of Le Jasmin on me. I wish I were better at descriptions. I’ll have to work on them. I think Annick Goutal is my favorite perfume house. I own more Annick Goutal fragrances than any other kind. They are just so lovely and different. This sounds amazing. Just tried to order a sample on Les Senteurs and they only listed the full size no samples. Placed my sample order and have just clicked back in, the samples are now available. So not fair, I only placed my order 20 mins ago! Thanks, but they’ve already shipped. Going to Belfast for our Anniversary in a few weeks so hopefully I’ll be able to try it there. Sounds weird, but this one is a scrubber on my skin. ALL of the AG scents are impossible on my skin, I wonder what they use?! I like them in the vial, on my friend, but on my skin they are just blah. Crazy, really. Happens to me once in a while with Guerlain, but just with Apres l’Ondeé. What a shame none of the AGs work for you — it’s one of my favorite lines! But plenty of others, right? How strange! I got a sample of this and the first thing I thought was that it reminded me of Apres L’ Ondee too. It made me feel a bit of angst and melancholy. What could cause that? On paper it sounded like something I would love…go figure. The only A.G. I like so far is Petite Cheri, and face it, what is there to be offended by? Do you see some kind of weird connect between Matin and Apres Robin? What could it be? -oops and Chevrefeille, uh, the Honeysuckle, I ran out of it. I don’t know. I don’t really see any connection with Apres L’Ondee, and Un Matin did not strike me as a melancholy scent at all. I’m stumped! I guess since I’m not the only one, we either got a extra sad chromosome in our sense of smell, or we must be associating a sad repressed event in our live. -or maybe we’re just strange little sniffers, lucky you Robin-I really wanted to love these. This is a very exotic perfume that starts the day as spicy (ginger) and ends as floral (gardenia, jasmine and champaca). I bought it because it includes champaca in the blend. I love it. Champaca, another favorite tropical flower of mine (other than ylang ylang) that is rarely mentioned in perfume blends. other than Tom Ford’s and is basically unknown to those who grew up in the temperate zone unless one is a “nose”. It has the most beautiful fragrance in nature that can’t really be captured by itself in a bottle. Un Matin d’Orage is just lovely, exotic and does not overwhelm. Other favorites from AG: Gardenia Passion and Eau d’Hadrien.